There are times when a full-fledged chart in Excel is overkill and you just want to create a quick visual representation of your data. 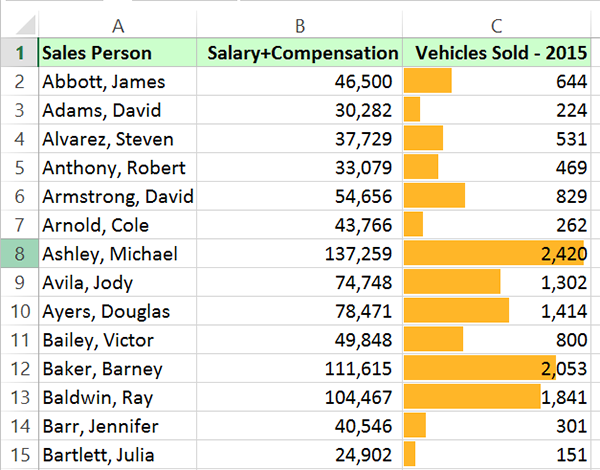 For those times, here are three in-cell alternatives for using charts in Excel. Sparklines are great to give you (or your audience) the big picture quickly without the fuss of a full-fledged chart. There are three types of in-cell Sparkline charts you can create: Line, Column and Win/Loss. To add one of these three Sparklines, go to the Insert tab and click the button for the Sparkline you want to use. When formatting your Sparkline charts, consider the following formatting options. 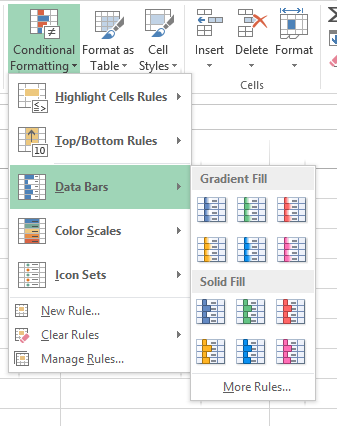 Conditional formatting is another quick in-cell alternative to creating a separate chart in Excel. Simply select your data and then choose Conditional Formatting on the Home tab. Next, choose Data Bars > Solid Fill. 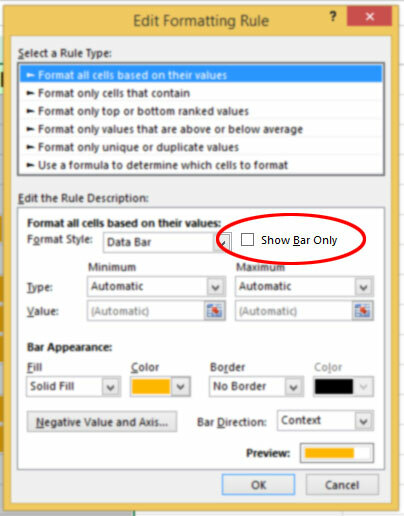 By default, the data that creates the bars will still be displayed in the cell (see screenshot below). Since you’re depicting the data visually, you may decide that you don’t need the numbers there at all. Once you click OK, the numbers will be hidden from view. The third option presented here is to use the REPT or Repeat function as an alternative to charts in Excel. The REPT function will repeat the same text or symbol for a specific number of times. 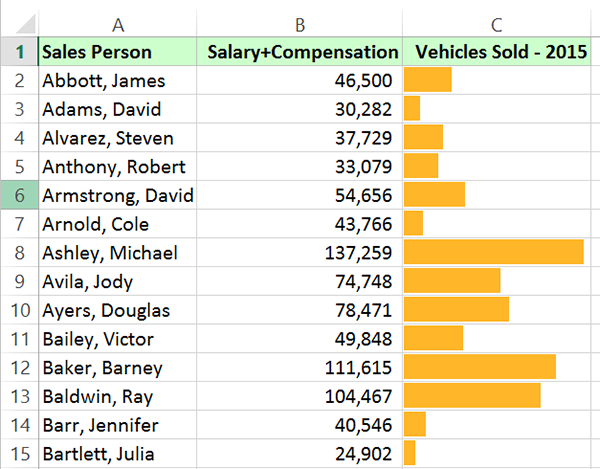 Let’s say you have salary information in column D of your workbook and you want to visually represent it in column E.
When you do this, for the value in D2, you will see a corresponding number of dollar signs in the corresponding cell in column E.
Bonus tip 1: if the number is too large, you can divide the value to make it smaller. For example, you could have =REPT(“$”,D2/10000), which will give you fewer dollar signs, but it will still give you a relative number for your data set to help you visualize your data. Bonus tip 2: Instead of entering text as the first argument in the REPT function, you can insert a symbol from the Symbol menu on the Insert tab. Want to master Microsoft Excel? 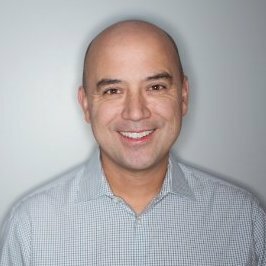 Check out the Lynda.com series, Excel Tips Weekly.